Eliminate Light To Moderate Scratches & Blemishes. 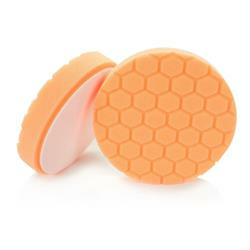 The HEX-LOGIC Orange Scratch & Swirl Remover Pad is tough enough to remove defects from paintwork, yet sophisticated technology means it polishes out to a high gloss finish. Use with compounds for heavier scratch removal and lighter polishes to remove swirls and fine scratches. HEX-LOGIC pads are constructed using durable, Acu-Pore technology and feature a laser-cut hexagonal pattern. The depth of cut is computer-regulated, dictating how aggressive the finished pad will be. HEX-LOGIC pads are colour coded in reference to the depth of pattern on the pad surface. The unique compression/load/deflection ratio allows the pad to flex easily to follow the contours of a vehicle for more uniform results. The hexagonal pattern allows compounds to travel along the grooves for even distribution of product as well as air flow, helping to prevent spot-heating issues which may over-cut paint, and allowing for longer working times.